Rolling along with the festive-themed ‘Desmond’s Quotes’, this post highlights another band member of the Brubeck Quartet making Christmas references in their solo. This recording is unique in that there are numerous quotes and references flying around, and it’s not just Paul Desmond that engages in the shenanigans. The recording that all this merry music-making takes place comes from a bootleg recording of concert that the Dave Brubeck Quartet gave at the Free Trade Hall in Manchester, England. As for the date, nobody knows for sure. It’s been pinned to late 1962 (November or early December), but as the case usually goes for bootlegs, the date isn’t known for certain and probably never will. The personnel, however, is known. 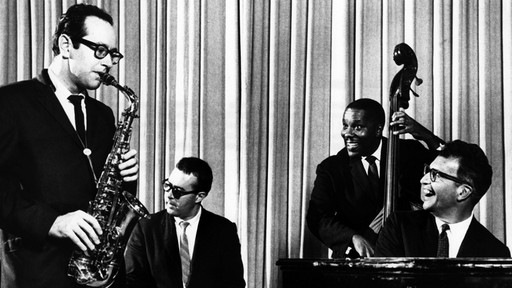 Desmond and Brubeck are on sax and piano, while Eugene Wright and Joe Morello are on bass and drums. The tune is “St. Louis Blues”, a tune Brubeck usually opened his concerts with. They stretch out for a whopping fifteen and a half minutes long, with Desmond blowing chorus after inspired chorus, followed by Brubeck’s lengthy solo. Wright’s bass solo follows Brubeck’s, then Morello adds his statements to the song, and then they wrap it up. With the exception of Morello, everyone gets some fun quotes in. In the four minutes that Desmond uses to improvise, he draws upon “Santa Claus Is Coming To Town”, “The Christmas Song”, a small nod to “When The Clouds Roll By” and a bit from Wardell Gray’s famous solo on the blues “Twisted”. Desmond probably quoted and referenced other tunes but I only recognized those three. Brubeck’s vocal and piano encouragements punctuate Desmond’s solo, giving an affirmative “yeah” when Desmond finishes. There’s quite a few quotes in this recording, including three Christmas quotes, so put your listening caps on and get ready to sleuth. First, here’s the actual recording of the Dave Brubeck Quartet playing “St. Louis Blues”. Now, here are the songs quoted in the the above track, in order of appearance. How many can you find? To help you out, I included the times that the quote appears in the above track beside the titles of the songs. Good luck! That’s a record number of quotes in one post!